Coney Island’s 21st Annual Sand Sculpting Contest is tomorrow at noon. Somebody please do an artful champagne bottle and flute castle and win first prize! If you’re feeling creative, it’s not too late to register at the event, which is free of charge. Mounds of sand have been prepared for fifty sculptors. According to the Parks Department, “In addition to amateur sand sculptors, a professional will wow spectators with an unbelievable ‘How did he do that? !’ creation in the sand, commissioned by the Aquarium.” The annual event is sponsored by Astella Development. 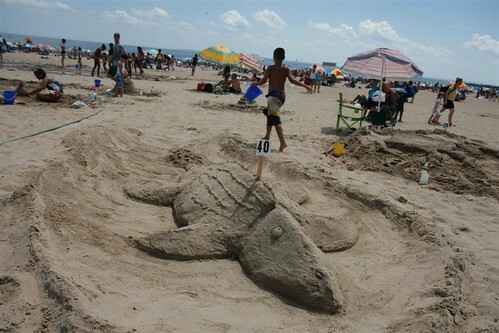 Thanks to Coney Island photographer Bruce Handy for his photo of this clever creature from last year’s contest.